Researchers at The Ohio State University and NASA's Jet Propulsion Laboratory have created the first-ever map of key regions of "submarine groundwater discharge," where freshwater and seawater mix unseen below ground. The previously hidden sites mark areas of vulnerability for ocean contamination and drinking water contamination. Areas in dark blue are vulnerable to pollution from land to sea. 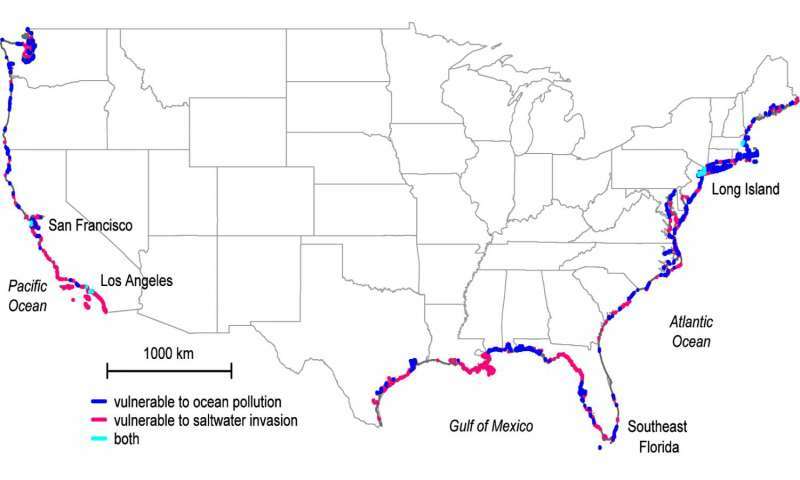 Areas in pink are vulnerable to pollution from sea to land in the form of saltwater intrusion. Areas in light blue are vulnerable to both. Credit: The Ohio State University. Researchers have uncovered previously hidden sources of ocean pollution along more than 20 percent of America's coastlines. The study, published online Aug. 4 in the journal Science, offers the first-ever map of underground drainage systems that connect fresh groundwater and seawater, and also pinpoints sites where drinking water is most vulnerable to saltwater intrusion now and in the future. Audrey Sawyer, assistant professor of earth sciences at The Ohio State University and leader of the study, said that while scientists have long known that freshwater and seawater mix unseen below ground, until now they hadn't been able to pinpoint exactly where it was happening, or how much. Together with partners at NASA's Jet Propulsion Laboratory, Sawyer was able to learn more about the previously hidden water exchanges via computer analysis, and without extensive and costly field surveys. "We're all pretty familiar with the idea that rain falls on land and flows out to the ocean in rivers, but there's another, hidden component of rainfall that infiltrates the ground near the coast and spills into the ocean below sea level," Sawyer said. "If you've ever been swimming in the ocean and felt a cold spot, there's a good chance that the cold spot is due to groundwater seeping out from underfoot." "We call it 'submarine groundwater discharge,'" she continued. "Freshwater flows out to sea, and vice versa. Urbanization, agricultural development, climate, and topography all affect how much water flows in either direction, and the exchange has a big impact on both onshore groundwater that we drink and offshore seawater where we swim and fish." The study identified 12 percent of the continental U.S. coastline—including the northern Gulf Coast from Mississippi to the Florida Panhandle, northern Atlantic Coast and Pacific Northwest—where the once-hidden drainage systems make the ocean most susceptible to freshwater contamination from septic tanks and fertilizer runoff. There, excess nutrients in the water can cause harmful algal blooms to form and remove vital oxygen from the water. This contamination from land to sea endangers fisheries and coral reefs as well as water recreation and tourism. In contrast, another 9 percent of coastline—including Southeastern Florida, Southern California, and Long Island—are especially susceptible to the opposite threat: contamination from sea to land, the study found. In these areas, saltwater intrudes inland and infiltrates the fresh groundwater supply. "It takes only a small amount of saltwater to render drinking water non-potable, so saltwater invasion is a big concern for water resource management in coastal areas," Sawyer said. Among the sites on the map with the worst impacts are Los Angeles and San Francisco, which the study found to be vulnerable to both ocean contamination and saltwater intrusion simultaneously. Overall, more than 15 billion tons of freshwater flows through invisible underground networks into the ocean along the continental U.S. coastline every year, the researchers found. That sounds like a lot of water, but it's less than 1 percent of the total amount that flows from the continental United States into the ocean, pointed out study co-author Cédric David of JPL. The other 99 percent comes from rivers and surface runoff. Still, David explained, the study is significant because it provides the first continental-scale high-resolution estimate of that 1 percent—a portion which, when compared to the other 99 percent, can be particularly rich in nutrients and other contaminants. Sawyer, David and James Famiglietti, also of JPL, combined U.S. topography and climate models to identify key inland regions that contribute groundwater and contaminants to the coast. They examined rainfall, evaporation rates and the amount of known surface runoff to calculate the missing portion of water that was running out below ground, and melded those results with terrain and land-use data to identify where the water ended up. For example, precipitation is similar in the Pacific Northwest and the mid-Atlantic regions, but the study found that underground drainage rates into the ocean were approximately 50 percent higher in the Pacific Northwest because the steep terrain there carries more groundwater to the coastline. Land use was critical to discharge in Florida, the study found, and Sawyer said that she was surprised by the big effect that canals had there. Since the early 20th century, Floridians have constructed thousands of miles of canals along the state's coasts for transportation, irrigation and recreation. The study found that the canals capture water that would otherwise flow underground and out to sea. As an example, Sawyer cited four adjacent counties along the Gulf Coast that have dramatically different amounts of discharge depending on the number of canals: Pinellas and Hillsborough counties, which have many canals, had about half as much below-ground drainage as Pasco and Hernando counties, which don't. The researchers commented that increased urbanization—and the extensive pavement that goes along with it—will also decrease submarine groundwater drainage in coastal regions where the population is growing, which increases the likelihood of saltwater intrusion. "That's why we hope others will use our analysis to better plan strategies for coastal land development and groundwater management that help preserve water quality," Sawyer said. "Right now, we've created a map of American coastlines, but we hope to be able to do it for the world shortly, as data become available."